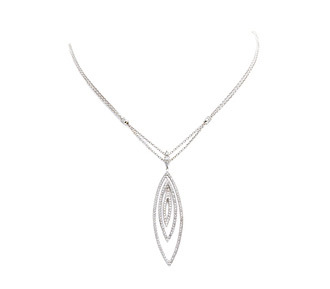 Three concentric leaf shapes with continuous diamonds set in white gold give this wedding jewelry diamond pendant necklace an elegant modern feel. 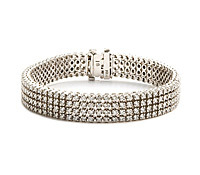 The delicate double chain featuring small diamond barrel closures gives the piece a lovely layered look. Diamonds: 1.12 TW | Gold: 14K White | Length: 17 in. | Pendant Length: 2 1/2 in.